If you want total control over your photographs, there are many extras you'll want to consider in order to make your digital camera experience a full one. First among these is the PC or Mac. The faster the better, and even more important than processor speed is RAM. Connected to my PC is a SanDisk 8-in-1 USB 2.0 Card Reader that can read and write 8 different kinds of digital "film" at USB 2.0 speed. Next you might want to consider buying a little "insurance" for your digital photos in the form of a backup system. Digital negatives are like other negatives...you should keep them in a safe place. The advantage of digital negatives over film negatives is that you can make multiple copies in case something happens to one of them. And as your collection of images grows, so will your need to have a large capacity backup system like a tape drive. I currently use external USB hard drives and a very good and inexpensive backup program (Handy Backup). Other accessories go with your camera. If you're using one of the "point and shoot" varieties of digicams, there's not much to add to them other than additional storage media cards. If your camera has the ability to use an external flash, I highly recommend getting one and using all the time, even outdoors as a fill flash. It will improve your indoor photos by at least 200%. What about displaying your digital photos? I found a fabulous gadget called the Kodak Smart Digital Picture Frame. This thing displays your photos in VGA resolution (640x480) brightly and in great color. You can set it to come on at a given time and to turn off at a given time, and the photos change before your eyes at predetermined intervals, such as 20 seconds, 1 minute, 1 hour, etc. The best part (besides the excellent display quality) is that it stores the photos on a compact flash card, so there's no limit to how many pictures you can show (could be thousands!). I've bought two of them on eBay for about $125 each, but recently I have seen them as high as $300 each. Unfortunately, Kodak has discontinued these, but may start production again if they recognize the growing market for them. If they were priced at $99, I'd buy several more. One of the neatest accessories I've seen is the underwater housing. I'm aware of several of them and I own one for the Canon S400. Others are available for the tiny Sony P1 and P5, plus most of the Canon ELPH models. 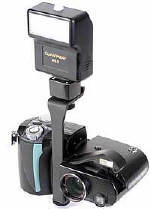 All of these allow you to take the camera 100 feet underwater, which makes it great for pool, lake, or beach use. These cost about $200, but if you use them correctly, you'll get some priceless shots.